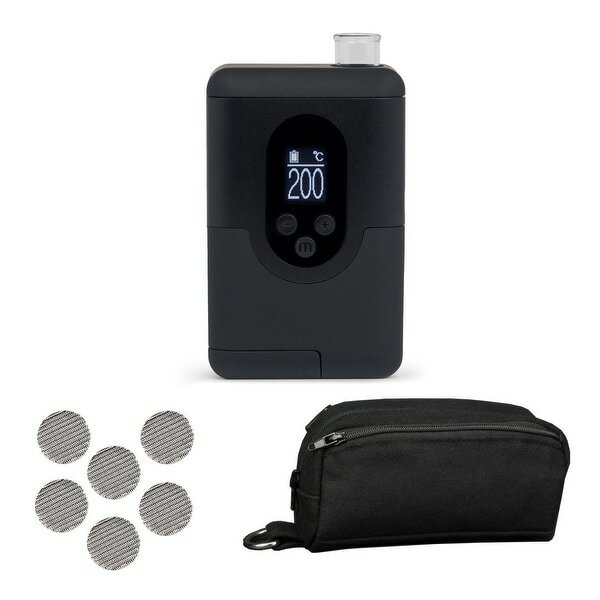 This kit supplements the Arizer ArGo Portable Handheld Aromatherapy Device with a pack of 6 extra screens and a soft-shell case. Protect your ArGo with the case specifically designed for the ArGo. The ArGo Screen Pack provides spares to make sure your unit is ready to go at all times. The Arizer ArGo with Screen Pack and Soft-Shell Case bundle is curated to complement your ArGo aromatherapy experience. The Arizer Go Portable Portable Handheld Aromatherapy Device is a premium made unit designed for ultimate portability. The ArGo provides an all-glass, isolated air path, hybrid heating, fast warm-up and precise digital temperature control. The ArGo is compact and portable unit that fits in the palm of your hand. The ArGo provides a clean, isolated air path; your aromatherapy takes an all-glass path without touching any other parts. A high quality ceramic heating element combined with Arizer's patented hybrid heating add to the premium vape experience. The ArGo warms up quickly, and you can easily and precisely control your temperature with the built-in digital controls. High-capacity, rechargeable, interchangeable batteries keep the ArGo powered for extended periods. A USB charger, optional dual battery charger and convenient use while charging further help to ensure the ArGo never runs out of power. The ArGo is an ideal on-the-go device. The ArGo is both easy to use and easy to clean. It consistently produces pure aromatherapy and maximum flavor, as well as choice. Custom session settings let you optimize it to your needs. The ArGo is constructed with only the highest quality components. These include premium borosilicate glass parts and push-top glass mouthpiece protection.